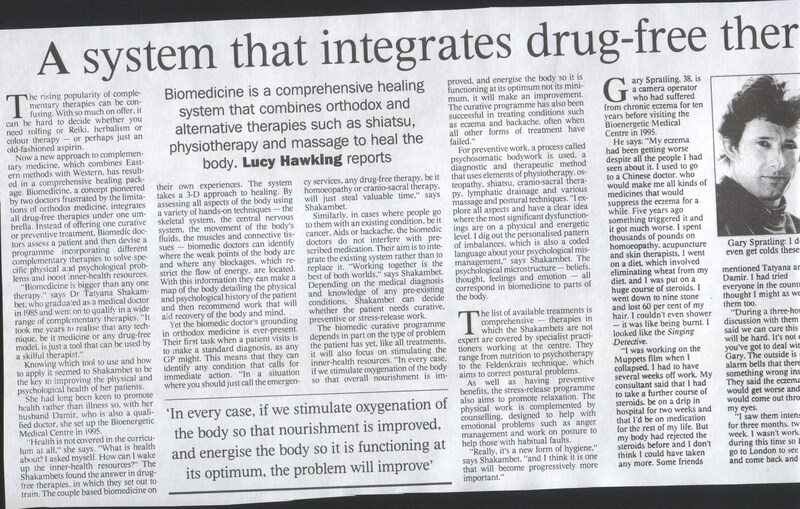 Bioregulatory Medicine is a comprehensive healing system that combines orthodox and alternative therapies to heal the body. The rising popularity of complementary therapies can be confusing. With so much on offer, it can be hard to decide whether you need rolfing or Reiki, herbalism or colour therapy - or perhaps just an old-fashioned aspirin. Now a new approach to complementary medicine, which combines Eastern methods with Western, has resulted in a comprehensive healing package. Biomedicine, a concept pioneered by two doctors frustrated by the limitations of orthodox medicine, integrates all drug-free therapies under one umbrella. Instead of offering one curative or preventive treatment, Biomedic doctors assess a patient and then devise a programme incorporating different complementary therapies to solve specific physical and psychological problems and boost inner-health resources. 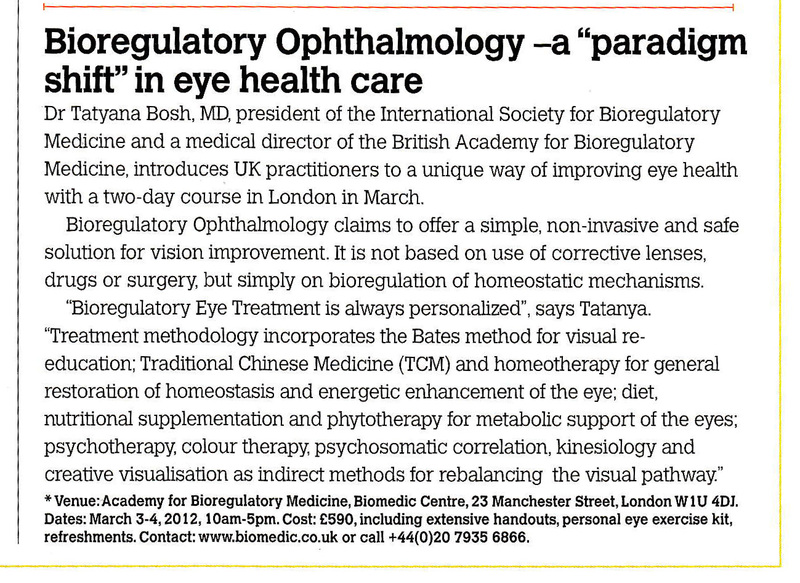 "Biomedicine is bigger than any one therapy," says Dr Tatyana Bosh who graduated as a medical doctor in 1985 and went on to qualify in a wide range of complementary therapies. "It took me years to realise that any technique, be it medicine or any drug-free model, is just a tool that can be used by a skilful therapist." Knowing which tool to use and how to apply it seemed to Bosh to be the key to improving the physical and psychological health of her patients. She had long been keen to promote health rather than illness so, with Dr Damir A Shakambet, also a qualified doctor, they set up the Bioenergetic Medical Centre (Biomedic) in 1995. "Health is not covered in the curriculum at all," she says. "What is health about? I asked myself. How can I wake up the inner-health resources?" The Bosh-Shakambets found the answer in drug-free therapies, in which they set out to train. The couple based biomedicine on their own experiences. The system takes a 3-D approach to healing. By assessing all aspects of the body using a variety of hands-on techniques - the skeletal system, the central nervous system, the movement of the body's fluids, the muscles and connective tissues - biomedic doctors can identify where the weak points of the body are and where any blockages, which restrict the flow of energy, are located. With this information they can make a map of the body detailing the physical and psychological history of the patient and then recommend work that will aid recovery of the body and mind. Yet the biomedic doctor's grounding in orthodox medicine is ever-present. Their first task when a patient visits is to make a standard diagnosis, as any GP might. This means that they can identify any condition that calls for immediate action. 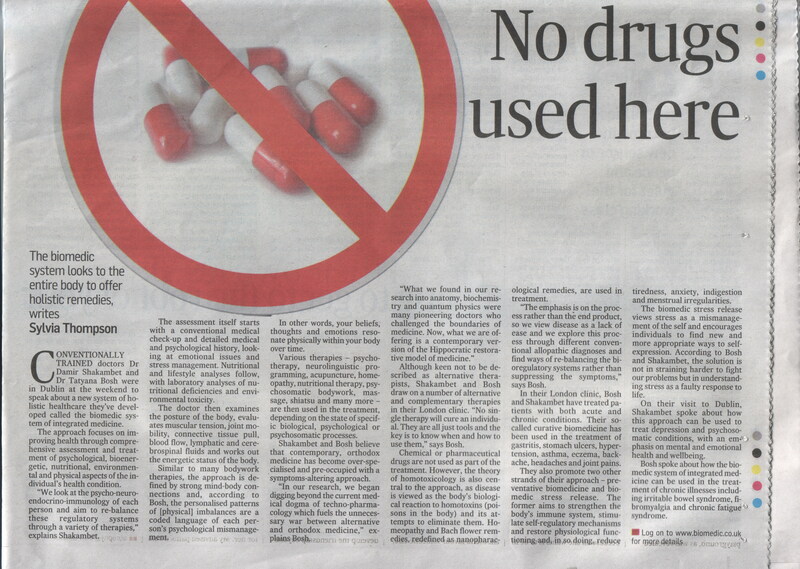 "In a situation where you should just call the emergency services, any drug-free therapy, be it homoeopathy or cranio-sacral therapy, will just steal valuable time," says Shakambet. Similarly, in cases where people go to them with an existing condition, be it cancer, Aids or backache, the biomedic doctors do not interfere with prescribed medication. Their aim is to integrate the existing system rather than to replace it. "Working together is the best of both worlds," says Shakambet. Depending on the medical diagnosis and knowledge of any pre-existing conditions, Shakambet can decide whether the patient needs curative, preventive or stress-release work. The biomedic curative programme depends in part on the type of problem the patient has yet, like all treatments, it will also focus on stimulating the inner-health resources. "In every case, if we stimulate oxygenation of the body so that overall nourishment is improved, and energise the body so it is functioning at its optimum not its minimum, it will make an improvement. The curative programme has also been successful in treating conditions such as eczema and backache, often when all other forms of treatment have failed." For preventive work, a process called psychosomatic bodywork is used, a diagnostic and therapeutic method that uses elements of physiotherapy, osteopathy, shiatsu, cranio-sacral therapy, lymphatic drainage and various massage and postural techniques. "I explore all aspects and have a clear idea where the most significant dysfunctionings are on a physical and energetic level. I dig out the personalised pattern of imbalances, which is also a coded language about your psychological mismanagement," says Shakambet. The psychological microstructure - beliefs, thought, feelings and emotion - all correspond in biomedicine to parts of the body. The list of available treatments is comprehensive - therapies in which the doctors are not expert are covered by specialist practitioners working at the centre. They range from nutrition to psychotherapy to the Feldenkrais technique, which aims to correct postural problems. As well as having preventive benefits, the stress-release programme also aims to promote relaxation. The physical work is complemented by counselling, designed to help with emotional problems such as anger management and work on posture to help those with habitual faults. "Really, it's a new form of hygiene," says Shakambet, "and I think it is one that will become progressively more important." Gary Spratling, 38, is a camera operator who had suffered from chronic eczema for ten years before visiting the Biomedic Centre in 1995. He says: "My eczema had been getting worse despite all the people I had seen about it. I used to go to a Chinese doctor, who would make me all kinds of medicines that would suppress the eczema for a while. Five years ago something triggered it and it got much worse. I spent thousands of pounds on homoeopathy, acupuncture and skin therapists, I went on a diet, which involved eliminating wheat from my diet, and I was put on a huge course of steroids. I went down to nine stone and lost 60 per cent of my hair. I couldn't even shower - it was like being burnt. I looked like the Singing Detective. "I was working on the Muppets film when I collapsed. I had to have several weeks off work. My consultant said that I had to take a further course of steroids, be on a drip in hospital for two weeks and that I'd be on medication for the rest of my life. But my body had rejected the steroids before and I don't think I could have taken any more. Some friends mentioned Tatyana and Damir. I had tried everyone in the country and thought I might as well try them too. "During a three-hour discussion with them they said we can cure this but it will be hard. It's not eczema you've got to deal with, it's Gary. The outside is giving alarm bells that there's something wrong inside. They said the eczema would get worse and that it would come out through my eyes. "I saw them intensively for three months, twice a week. I wasn't working during this time so I would go to London to see them and come back and lie in bed and weep. During the sessions I would have homoeopathy, cranial work, acupuncture and massage. The eczema did get worse and I got shingles in my eyes. But after that I started to get better. After about 18 months I went on holiday with my wife to Cornwall, where I went into a huge dip. The following day I was so much better and that was the turning point. My eczema steadily improved until it disappeared. For a while I returned every three weeks and now I see them when I want to and have just massage or maybe up to four needles, where before I would have had 20 to 30. "What they did was to take away the layers of problems that over the years had built up; like peeling an onion, until they got to the core where they could make a difference. You have to go deep down, back ten or 20 years, to the root of the problems that triggered the chemical imbalance. I believe it was that faulty build-up that gave me eczema. Now if I have an itch, I know how to deal with it myself to make it go away. I don't even get colds."